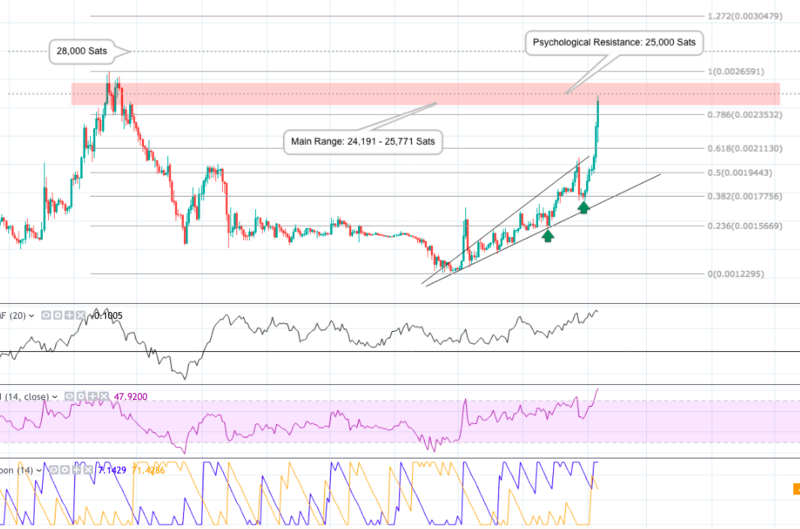 Binance Coin (BNB) Technical Analysis: Up 101% Despite Bear Market, New All-time High Soon? Binance Coin (BNB) continues to climb despite the crypto space suffering one of the worst bear markets on record, mooning over 100% in the last 3 months. The asset has had a history of outperforming many other altcoins during times of poor performance, and has become a popular hedging coin against the falling crypto market. In the last few weeks however, BNB has taken things to an entirely new level. Today BNB has managed to break into the top 10 largest cryptocurrencies by market capital, kicking Bitcoin SV into #11 spot. The arrival of Binance’s new Launchpad project announcement appears to be main driver for this latest surge of new momentum, which has driven BNB up a massive 17.92% against BTC in the last 24hrs. According to the official Binance twitter post, the new project to feature on Binance’s flagship ‘token launch platform for transformative projects’ will be Fetch - an AI and Machine Learning project that’s aiming to create an ‘economic internet’ with distributed ledger technology. After Tron’s hugely successful BitTorrent token (BTT) ICO sale boomed after featuring on Binance’s Launchpad platform, traders are anticipating the new Fetch ICO will create similar lucrative opportunities. Since traders can only purchase Fetch (FET) tokens with BNB during the sale, the price of BNB is expected to continue rising as demand reaches new frenzied heights. On the 1D BNB/BTC chart we can see that the asset was initially tracking inside an ascending broadening wedge shape from November 29, when it hit a bottom at 12,295 Sats, to January 28 just before it springboarded off the 0.382 fib level support and went vertical. Looking at BNB now, the price action appears to be running into some strong selling pressure as it closes in on the psychological 25,000 Sats mark. We could see bulls retreat to the 24,191 Sats level before regaining composure or perhaps find a stronger footing at the 0.786 fibonacci support (23,532 Sats) further below. 1D indicators are still favouring a bullish continuation despite the current correction, and are not showing any early signs yet of a worrying bearish reversal. -The indicator line on the Chaikin Money Flow indicator is still rising high above the zero line as buying pressure increases. -Buying momentum is also showing a marked rise on the RSI, with the indicator line now spiking high into the overbought region. -The Aroon indicator was showing a brief moment of correction over the last 4hrs as bearish sentiment appeared to be prevailing. However, recently the Aroon Up line (blue) has managed to return back above the Aroon Down Line (orange) as bulls take back control. All price target ROIs/ losses are calculated from the asset’s current value at 23,532 Sats.